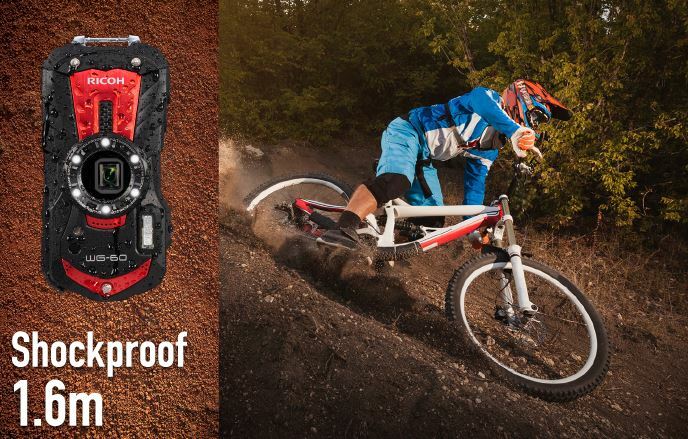 Compact waterproof cameras endure many of the same issues as any other compact electronic device. It can be tough to cram powerful components into small spaces. It’s particularly tough if you expect to achieve more than just waterproofing. Sometimes people choose waterproofed cameras because they’re concerned some small amount of water might eventually splash their camera. Other times, people choose waterproofed cameras because they know their camera will get wet all the time. It sounds like a small distinction, but what we’re talking about are two very different cameras. When you make a camera that doesn’t look like every other model on the market, it tends to stick out. Whatever you happen to think of the Ricoh WG-60, it does have its own totally unique style. The red version in particular looks more like a fashion accessory than a camera, using a design that’s reminiscent of several high-end timepieces. Once you get past its looks, the WG-60 is actually impressive on many levels. The exterior and interior hardware are amply supplied, to say the least. And while many waterproof compacts tend to endure losses with respect to versatility, in many ways, the Ricoh WG-60 is indistinguishable from a much larger camera. 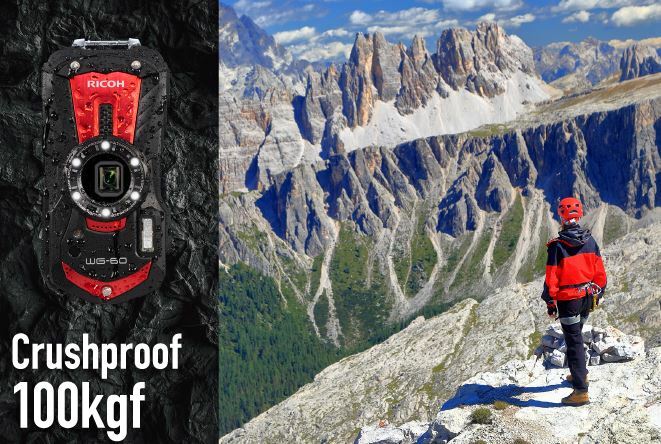 The WG-60 Waterproof Digital Camera measures 4.8 x 1.2 x 2.4-inches, which makes it slightly more portable than a smartphone. Including the battery and a memory card, it weighs about 6.8 ounces, which also compares favorably to a smart phone. WG-60 has two variants, red and black. The red variant is actually mostly black itself, but it makes use of stylish red highlights. 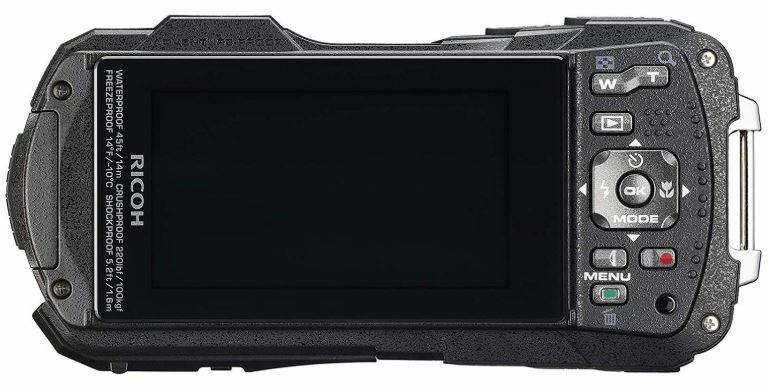 The black variant looks more like an ordinary camera, though still covered with distinctive edges and grooves. In both instances, the chassis is an amalgamation of hardened ABS plastic and aluminum. Those materials paired up allow for a lightweight, crushproof design intended to withstand about 100 kilograms of force. With some napkin math, hitting the WG-60 Waterproof Digital Camera with a hammer might produce about 50 kilograms of force. Though you probably shouldn’t start hitting your camera with a hammer, you don’t have to cringe in horror if you accidentally drop the camera on cement. Turning to the face of the WG-60, six LEDs are placed around the front of the lens, which can ensure the camera does not cast a shadow on the subject of a close shot. These LEDs are actually quite good at highlighting small details as well. 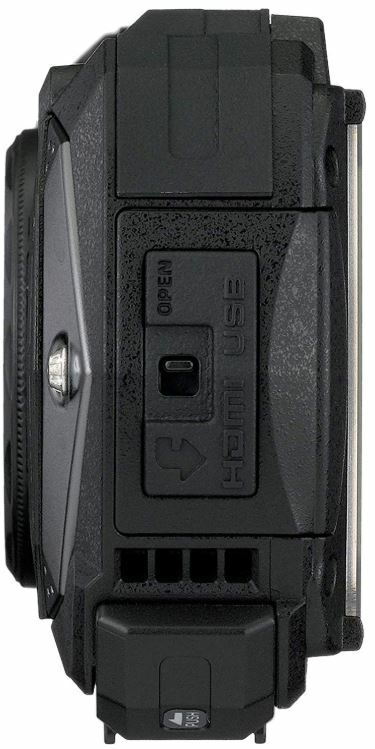 Almost the entire backside of the WG-60 is covered with a large 2.7” LCD screen. It provides an excellent viewing space for previewing your content, but if you’re looking for something bigger, you can attach the camera to a larger display with the help of a Type-D HDMI connector. 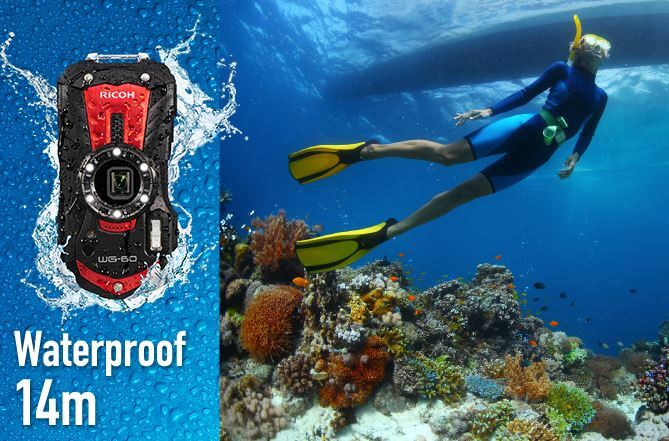 On its lengthy list of features, the Ricoh WG-60 Waterproof Digital Camera has many considerable underwater performance abilities. Combined, they help ensure this camera is capable of shooting in virtually all conditions. Not quite any condition because the WG-60’s underwater performance taps-out after two hours at 14 meters. But provided you’re not literally 30-feet under the sea for several hours, you should find the waterproofing adequate. In addition to its shock-proofing, the chassis is design to withstand drops of 1.6 meters. The body is actually layered with its stylistic texturing not only in the interests of looking neat, but also to help give the entire camera a great gripping surface. Even as the device gets wet, or your hands become cold, you can always find a place to hold the Ricoh WG-60. If it wasn’t obvious, the Ricoh WG-60 is intended to be operated both indoors and outdoors. One way it excels in that role is by allowing you to toggle the brightness of the LCD up or down, which makes using the camera easier in brighter or darker spaces. As you move from an area that’s well-lit to an area that’s barely lit, you can make on-the-fly adjustments in only a few taps. Additionally, the Ricoh WG-60 is freeze-proof. That allows for operation in conditions as cold as -10°C or 14°F. Though this protection will keep your battery in operation, it’s worth remembering that for any battery exposed to colder temperatures, performance will become dismal. There would be little point to creating so much protection if the camera was no good. Actually, the performance is somewhat remarkable for a waterproof compact. The 1/2.3″ CMOS sensor provides a 16-megapixel resolution, and enables a wide range of low-noise shots. In addition to shooting stills, you can shoot movies in full HD at 30fps. There are a variety of high speed and slow motion modes, as well as an underwater mode. And all of them can take advantage of movie shake reduction features to make handheld shots more watchable. The WG-60 boasts 5x optical zoom, beginning at 28mm. You can stretch your shot further with a digital zoom, which is approximately 7x. Additionally, the WG-60 includes a variety of effective focus modes. Among them you’ll find macro, 1cm macro, pan focus, infinity, manual focus, and standard. Having great photo modes is not unusual for a compact camera these days, but having so many of those modes also work on videos? That’s rather unique. Extensive features are what make cameras like the Ricoh WG-60 so versatile. This kit includes a total of 25 shooting modes. Among them, flower, pet, fireworks, portrait, sport, food, night scene, underwater, landscape, kids, snow, HDR, and several more. As you may be able to tell, each mode is balanced specifically for a particular type of activity. For instance, the underwater mode makes underwater colors appear more natural. It primarily does this by adding shades of red to the shot. That’s because reds tend to get become washed out in photos taken underwater. The majority of these modes are somewhat self-explanatory, and all of them can be individually adjusted to accommodate your own creative impulses. There are also a number of smart features that aren’t tucked away behind option windows. For instance, you can use a flash off/on mode, which takes two photos from one click of the shutter button. One photo has flash, one does not. The general idea is you can worry about composition instead of worrying about controls, and then decide which shots worked later. The self-portrait assist mode can use macro LEDs to show the location of the frame at the moment when you’re trying to take a selfie. It helps you aim the camera to frame the shot. There’s even a feature which releases the shutter when the camera sees a smile, which can also be used during the selfie mode. Like so many cameras these days, the Ricoh WG-60 Waterproof Digital Camera includes a variety of digital filters you can apply to your shots. They include common filters like extract color, toy camera, and retro. It also offers five image tone detection features, autofocus, auto-bracketing, auto-tracking, and auto-exposure for up to 32 subjects. It even has lamp assist, continuous shooting, and essentially every other feature you’d find inside a camera four times as large. 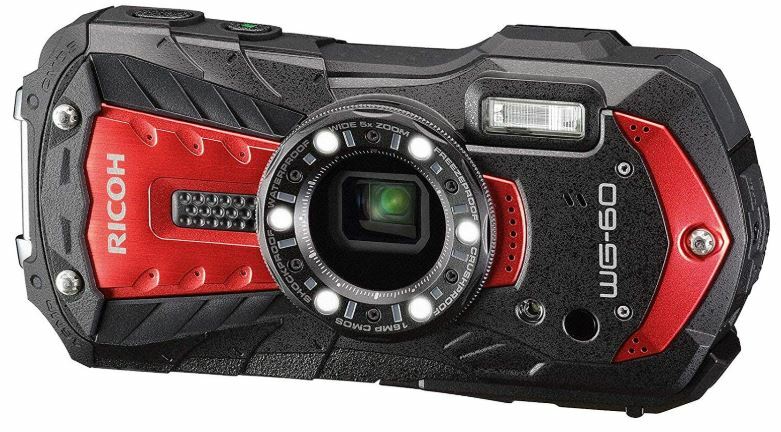 Moreover, the Ricoh WG-60 Waterproof Digital Camera includes its own movie editing features. They can help you create or split stills from the various frames of your film. It’s not a complete substitute for a full-fledged video editing program, but it can help you do some basic things. The camera’s layout is somewhat standardized, and looks similar to almost any camera, with few exceptions. The shutter button is exactly where you’d expect, but next to it is the power button. The power button is slightly smaller than the shutter button, which helps you avoid the mistake of pressing the wrong button. Both are texturized to help indicate when your finger is positioned properly, and to give you greater control over the pressure sensitive shutter. The remainder of the controls are crowded on the right-side of the WG-60. Their positioning is orderly and sensible, and each button uses icons which should be instantly identifiable to anyone who’s used a camera in the past thirty years. Among them are the usual suspects like a flash button, menu button, zoom buttons, and so forth. The Ricoh WG-60 Waterproof Digital Camera is powered by a rechargeable lithium ion battery, which can be swapped and replaced in only a few seconds. An individual battery is intended to last through roughly 300 shots or 260 minutes of video recording. Those figures are assuming room temperature. It’s worth keeping in mind that the battery capacity will drop if you start shooting in the cold. And that’s when you might want to start carrying around a couple of replacement batteries to smooth things out. The WG-60 makes use of FlashAir and wirelessly enabled SD cards, meaning you can transfer shots to your smartphone pretty easily. You can also turn the wireless LAN off to reduce power drain. If you’re interested in using the wireless SD card feature, the cards you want are Toshiba SD-UWA W04 FlashAir SDHC/SDXC. You can find nearly two dozen accessories for the Ricoh WG-60, which are not included. Among them, a sports strap, floating wrist strap, waterproof remote, battery charger kit, replacement battery, peg mount, handle mount, suction cup mount, adhesive mount, and so on. The Ricoh WG-60 does include a lithium ion D-LI92 battery, power adapter, USB cable, strap, and a micro stand. 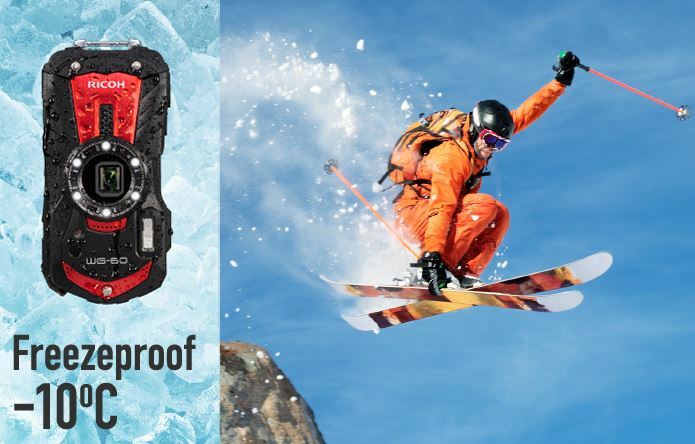 Who Should Choose the Ricoh WG-60 Waterproof Digital Camera? The WG-60 is a capable of shooting a huge variety of outdoor activities, from kayaking and rock climbing, to skiing and sunbathing. It has almost every feature you would expect from a camera twice this size. Unquestionably, it’s a powerful replacement or alternative for any smartphone camera. Durability is much of what you’re paying for. This camera is not quite indestructible, but it’s certainly in that neighborhood. Provided you need durability, the Ricoh WG-60 Waterproof Digital Camera is a good choice for amateur photographers and professional photographers alike.